National Bank of Ukraine gets into circulation a silver commemorative coin, dedicated to patriarch Lubomyr Huzar, denomination of 5 gryvnias and with a circulation of 2000 copies, informs a press-service of NBU. 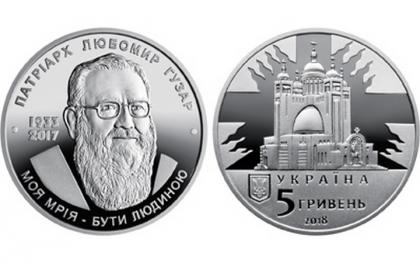 “This commemorative coin is dedicated to patriarch Lubomyr Huzar – one of the spiritual beacons of Ukrainian nation. A person who is fairly called nation’s conscience”, is said in a message. On the obverse of the coin there is an image of Patriarchal Cathedral of the Resurrection of Christ (Kyiv) depicted on a mirror background of a stylized cross-like ray, in the bottom – small State Coat of Arms of Ukraine. On the reverse side of the coin there is a portrait of Lubomyr Huzar. On the left - the years of his life - 1933/2017, a quote below: “Me dream is to be human”. As it is known Lubomyr Huzar was born in Lviv but in 1944 his family had to emigrate abroad. He studied and worked in Austria, USA, Italy and came back to his Motherland after Ukraine had got its independence. In 2001 he headed Ukrainian Greek Catholic Church. Owing to Lubomyr Huzar it was agreed to transfer a throne to Kyiv with building Patriarchal Cathedral of the Resurrection of Christ. Wise words of the Patriarch meant a lot to millions of Ukrainians. Even after leaving a position of a Church governor he remained to be a credible social leader, responding actively to important events in life of Ukraine and worldwide.